I need some advise on a table top that a customer requested me to build. Currently, the customer has a round table top with solid oak edging and a veneer center (see photo). They would like me to build a new top to replace the existing one as the veneer isn’t performing well with the normal use and abuse. They like how the design of the top is pie shapped with regard to the veneers in the middle and want to have that same look with a solid table top. My question is this: do you think solid wood (red oak) will perform ok if the top is built out of solid stock and arranged like pieces of pie to match the look of the current veneered top? I’m concerned about expansion and contracting of the red oak in the pie shape. I’ve built several table tops but none like this and I really don’t know what to expect if I make solid wedges. What do you think? The customer isn’t opposed to a traditional layout but prefer the pie shape if possible. Thanks for your input! I think you will have problems down the road if you use solid wood for the pie slices, I definitely would not do it with the cross grain border shown, that will self destruct. Is there a reason they don’t want veneer? sounds like a finish issue, can you talk them into using a more durable finish instead? Nw, you should be fine with the pie shaped pieces if you don’t do the edge banding or restrict the movement with the undercarriage attachments. However, I can’t visualize how you will get the great design that the veneer affords. Thank you both for your input. The issues that they are experiencing with the veneer is partially related to the finish failing which causes the veneer to delaminate from the substrate and bubble up. You really can’t see it from the picture. I’m leaning towards trying to sell the customer on a single grain direction. This is for their second home in the mountains and they allow friends and family to use the house from time to time so I don’t know that everyone who uses the home takes care of the furniture like they should. I actually think that the pie shapes might date the table some anyway but I’m certainty not an expert on the latest trends and designs. I’m absolutely not a professional, but when I have seen similar projects from the woodworking magazines it has always been a veneered surface. If it were my table I’d want the grain all going the same direction. I feel like a solid wood table, especially oak in a second home that may not always be climate controlled, could end up cupping or doing something funky. Opening up right in the middle or something. People don’t think about how seeing all this plywood and fiberboard furniture affects their perception of what real wood furniture should look like! I didn’t either until I started making things. For example, everyone and their mother wants a table with a mitered border, because that’s how you make a particleboard or plywood table. But in solid wood the mitered border just doesn’t work! It’ll open up in the corners. But it blows people’s minds. patterns that will work in solid wood. 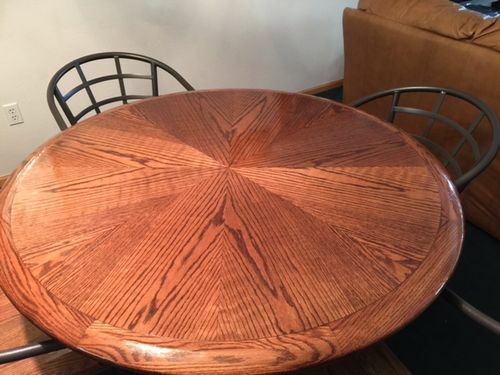 My guess is that a solid wood top consisting of glued up wedges with the wood grain running from the perimeter to the center or with the wood grain running perpendicular to the diameter lines of the top will fail. A diagonal orientation of the grain of the wedges might be ok, but I am not sure. By my reckoning a top with a given as-built diameter would have a given and fixed circumference defined by and directly related to the diameter of the top. But as the wood expands, the diameter remains constant since the diameter runs parallel with the grain of the wood. However as expansion occurs this expansion tries to increase the circumference of the table top, but since the diameter is fixed, the top could bow. Likewise, but in reverse when the wedges shrink but the top could crack. Changing the grain orientation so that end grain meets end grain at the joints of the wedges could be problematic as well (wood grain 90 degrees to that shown in the photo). In this case, the diameter of the top wants to expand as the wedges gain moisture. But the circumference of the top would want to remain fixed. I am not sure whether the top would survive expansion and contraction if the wood grain of the wedges is orientated diagonally to the joint lines between the wedges, that is, perhaps at 45 degrees to the diameter drawn along the joint lines. In this orientation, wood could expand along the diameter and at the circumference. I might attempt this table top with this diagonal grain orientation if the table was for me in my home; but I am not sure that I would attempt the solid wood wedged table top for a client. The problem with pie shaped tables is the center will want to separate. Same problem in bowl bottoms with segmented turning. One solution is a loose panel/disc that floats in the center. The rest of the table can expand and contract as it wants and you’ll be okay. And like Art said, no edge treatments. I can think of nothing but problems, it is a job that I would turn down. One thing about the look of the table is that the veneers are book matched. You would not be able to achieve that look with solid wood and with all of the wood movement problems inherent in that design your customers will be disappointed in the end. It’s a lose/lose.